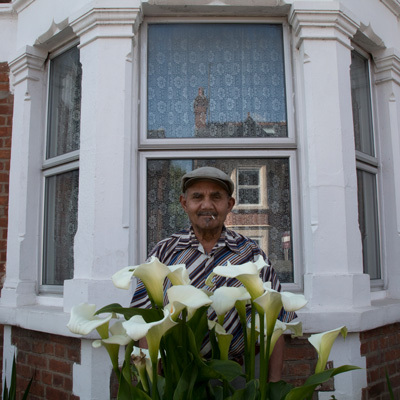 I am writing a book on the social and cultural history of the Cowley Road area of east Oxford – publication due October 2015 with Signal Books. As part of the research I am interviewing all those people who have been so central to Cowley Road becoming such a centre for anyone interested in food and how it has evolved since the early 20C. The arrival of Asian shops and restaurants, the rise of the wholefood movement (and fairtrade) the role of Mediterranean and Eastern European food outlets as well as east Oxford being a site of production – orchards, allotments, smallholdings, community gardens, foraging – as well as consumption. 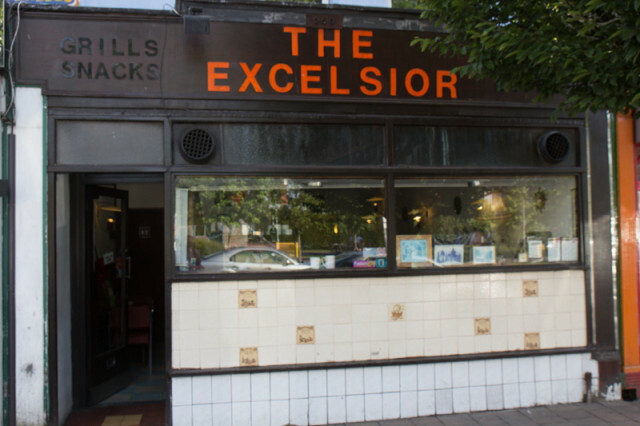 One of my first visits was to the Excelsior Cafe, a landmark on Cowley Road for as long as anyone can remember. Andreas Koumi is the proprietor and in my interview with him last month I discovered that he had opened it in 1961. Its image is fairly down market – cheap and cheerful all day breakfasts, tea and coffee and a clientele who are often on the margins of society, even by Cowley Road standards. Andreas always has time to talk and my interview with him over coffee ranged from where he got his supplies from – the coffee is all ground by him using only organic beans, something of a surprise to Cowley Road coffee buffs who have always spurned his premises, to famous regulars including Rick Stein when he was a student at Oxford in the 1960’s, and the origin of his ‘specials’ menu. 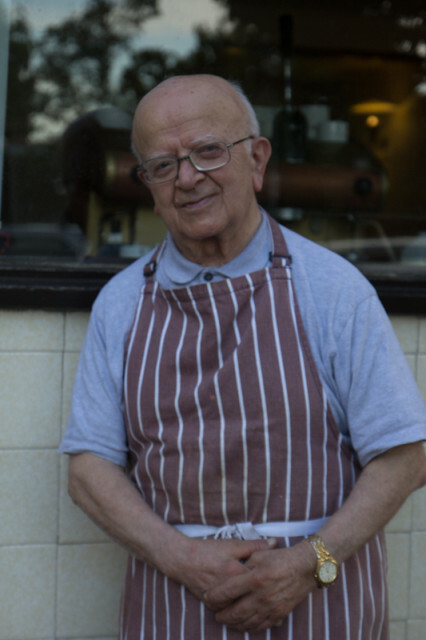 Being Greek Cypriot in origin, Andreas generally has moussaka on the menu. What is his secret recipe? Its the Rick Stein connection. He uses a version of the great man’s recipe. Last week I popped in for a coffee and Andres took me aside. ‘I’m packing it in’ he said. ‘I’m 80 and its time to stop.’ ‘When?’ I asked. ‘The end of the month’. Today I went and bought a card for him. I got to the cafe and there was a hand-written sign on the door saying that it was closed. Too late, I thought. But no, the door was ajar and I went in. There he was on his own surveying the cafe for the last time – and he was leaving it exactly as he had it for all those years. His son Evripides, was standing by the door. Andreas and I had a few words and I gave him the card. ‘You can’t chat for long’ he told us, ‘His wife is waiting for him in the car’. And with that I watched as he locked the door for the final time and walked down the Cowley Road to the waiting car and retirement. Its really great to see a project that been ages in the making come to fruition. A bit like the first apples off an apple tree grown from seed. Several years ago I helped fund (in fact I’m an Executive Producer) a young film maker, Karney Hatch who had a great idea – a documentary on urban agriculture worldwide. Well now its errr, hatched. From Cuba to Shanghai, the USA to the UK the documentary is a moving portrayal of the successes and challenges of the urban agriculture movement and its premiere is now scheduled, for the Portland Film Festival from 26 August. Karney has managed to team up with Hollywood star Daryl Hannah (she of Blade Runner, Kill Bill, Wall Street, Steel Magnolia and other movie blockbusters fame) who is also a really committed environmental campaigner who was arrested outside the White House in February 2013 protesting against the Keystone pipeline and once spent three weeks tied to a walnut tree on an urban farm in south LA which was threatened with redevelopment. Karney has released a short trailer which you can watch here. Lets hope it too turns into another blockbuster with that touch of stardust! Its a while since I’ve been to Ireland, but I took a 60th birthday trip at the end of April. Its home to my mothers side of the family (Hegarty, Co. Cork) so it always feels like a bit of a homecoming. The Irish are earthy, but on the whole not great gardeners. Staying in Co Galway and enjoying glorious weather in Commemara and out on Aran, it was the ideal time for touch of garden exploration. 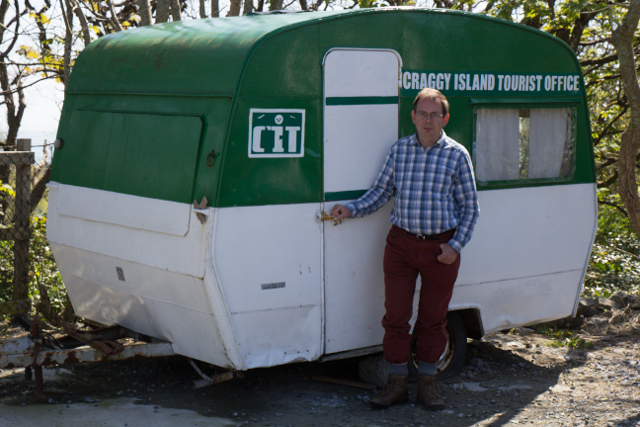 The Craggy Island Tourist Office were most helpful and we found ourselves at Brigit’s Garden on the edge of Connmemara about 15 miles out of Galway. Part visitor attraction part spiritual retreat, yes the two do mix, they do a roaring trade in the American ‘Spiritual Tourism’ market, it is certainly a garden like no other. St Brigit was the 6th Century Abbess of Kildare and the name means ‘exalted one’. She has three representation in the Irish tradition, as patron saint of midwifery/fertility, of poetry and of the forge (iron-smithing). Quite a multi-tasker. 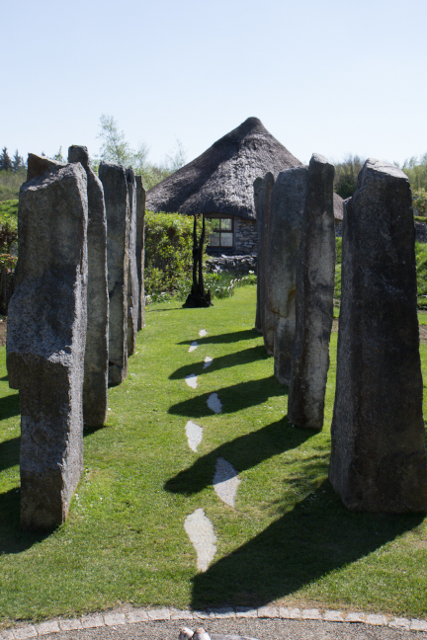 The gardens, which are celebrating their tenth anniversary this year, are based around the Celtic cycles of the year with four gardens representing the Celtic festivals of Samhain, Imbolc, Beltaine and Lughnasa. Anyone who has read my book ‘Spilling the beans’ will know all about these of course. Centred around a roundhouse used for everything from weddings to meditation, the gardens are absolutely stunning. This is not a garden in the English tradition of Hidcote or Great Dixter, but something uniquely Irish with a grass mound earth mother in Samhain, ‘a sleeping woman representing the earth in its winter rest’, a sculpture of the three faces of St Bridgit in the Imbolc sunken garden, a grassy circle for dancing in, enclosed by standing stones, in Lughnasa and most extraordinary of all, a remarkable set of gigantic granite standing stones marking a processional way to an ancient throne made of 5,000 year old bog oak and yew. The standing stones look like they could have been there for thousands of years. In fact low loaders and large diggers brought them in and erected them just a decade ago. If it all sound a bit New Age, it proves that context is all, because the gardens and the surrounding nature trail stretch over an 11 hectare site which is imbued with a strong sense of the mystic and the Celtic. It is not far from Loch Corrib and the area is mainly limestone, but glacial eskers wind their way across the landscape, including the site. A ring fort surrounded by ancient hedges is within the site and the trail includes some remarkable collections of plants and trees including right beside each other a mature ash, oak and a gigantic goat willow, all long preceding the construction of the garden. These natural features have been skillfully combined and enhanced with newly created wild spaces such as a ‘lochan’ (small loch), an esker wood and meadow and sculptures and points of interets such as a ‘dream shelter’ and the largest sundial in Ireland (pictured). The love of the natural, the wild and the spiritual are well served, but so too are more prosaic tastes in the cafe, shop and visitors centre. Ireland’s equivilent (roughly) of Prue Leith, Georgina Campbell recommends the food and the gift shop is stocked with an impressively expensive range of goods, doubtless aimed at visitors from Southern California (or south Dublin). None of this would have happened without the energy and commitment of founder Jenny Beale, who slightly ruefully told me that the years of planning and construction (she is pictured in the 10th anniversary time line driving one of the diggers in the early construction days) had been the most fun and that worries about visitor numbers, (the crash of the ‘Celtic Tiger’ less than three years after is opening didn’t help long term financial sustainability) wedding bookings and resolving car parking problems, had slightly taken the gloss off the excitement and the sense of a spiritual adventure of the early days. For Lord and Lady Muck though, none of that mattered as we plunged into the unexpected delights of a cornucopia of Celtic mysticism and horticultural experimentation. The current series on BBC2 ‘The Big Allotment Challenge’ (BAC) has attracted quite a bit of comment from plot holders on my site in between the digging and planting of potatoes etc over the Easter weekend (traditionally potatoes are planted on Good Friday. I’m running a somewhat behind). There is a fair amount of division about how realistic it is between those who aren’t at all impressed by this new commodification of allotments as a place for yet more competition and those who reckon its actually pretty realistic as many allotmenteers are really keen on horticultural shows and competitions of all kinds. Lets face it ‘biggest leek’ and ‘biggest pumpkin in show’ competitions and associated skulduggery are the stuff of legend and the source of much comedy over the years. In that sense the the BAC is part of a venerable tradition. Opponents of this view see this as yet another example of the way in which TV undermines the solidarity and conviviality of seed swapping, surplus crop sharing, cultivation tips, lending of tools and the gifting of spare soft fruit bushes and the like. Mutuality, co-operation and harmony all round. Neither image, (or perhaps both) are entirely accurate of course, but from one viewing, several things certainly strike me. For a start the BAC isn’t actually on an allotment. Its in a fancy Victorian walled garden somewhere in rural Oxfordshire. So, no deer break in to wreak havoc, beer cans and condoms don’t get chucked over the fence, the neighbours haven’t let their dandelions go to seed and nobody’s small child is running ever so slightly wild and failing to recognise those newly planted out seedlings for what they are. Also… it never rains (except when it needs to I suppose), its always sunny, everybody hugs each other a lot (I’ve had an allotment for well over 30 years and I’ve never seen that behaviour!) the fruit and veg all come up and are perfect (dream on…) and most amazing of all, the plots are all dug and the soil is perfect. Paradise on Earth in other words. Made for TV even. For a moment I was even regretting having turned down the offer of being one of the participants when they were trawling allotment sites for potential participants a year or so ago. But not really. My friend Robert was hired as an adviser. He only lasted one programme before resigning. Amongst the hilarious episodes he retells were the assumption by the production team that black currants could simply be picked and turned into something delicious after one season. When it was pointed out that this was impossible and the plants need several years to become established before they produced fruit in any quantity, the production company simply went down the local garden centre and bought a whole lot and put the in the ground. The participants – all clearly selected to tick some demographic or socio-cultural box – by and large don’t live anywhere near the site. The production team seemed to think a fortnightly visit to tend the produce would be fine. Rapid re-think as reality took hold! This is my problem. I’m not mad keen on the competitive aspects of the programme, but then its TV, it goes with the territory. What I’m much less happy about is the extraordinary romanticisation of the growing of fruit and veg (and in these programmes flowers too). The sheer hard work of digging the plot every year, the shifting of muck and compost, the realisation that due to late frost, too much or too little rain, random happenings (I still recall a hailstorm in late June a few years ago that wrecked my entire apple crop, puncturing the skins of the still tender a fruit and making the whole lot rot before they ripened), the watering, transplanting, thinning, harvesting and pruning and the fairly high risk that despite all this some crops will fail completely, others will be pretty disappointing and nearly all the rest will appear in quantity and be beautifully tasty (for a short period of about 3 weeks) but look like something the supermarkets would have fifty thousand fits at if some poor farmer tried to sell to them. All are completely glossed over, or in a couple of cases made a bit of a joke of (straight runner beans….whoever heard of such a thing). Everything at BAC is literally (if episode two was anything to go by) rosy in the garden. It makes it all look too easy, apart from the stress of the competitive element of course, and sadly after gardening programmes like this, when new plot holders arrive on site and discover the slog that is really involved, disillusion often sets in rapidly. Making a watchable TV programme about the realities of allotment life… now that is what I would call a real ‘Big Allotment Challenge’. It all started on a summer’s day in 2008. 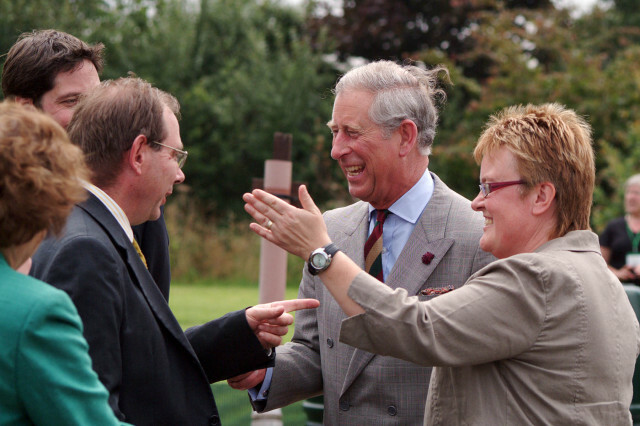 There I was, talking to Prince Charles on his visit to Garden Organic to celebrate their fiftieth anniversary. 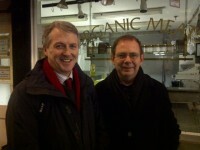 I was on hand to discuss composting. He is a man who knows about such matters. Slightly surprisingly the conversation turned to hens. He is an enthusiast of them too (who knew?) and the idea of promoting hen-keeping as part of the errrr… ‘battery’ of waste reduction techniques was born. Fast forward a year and Margi Lennartson and I were in Flanders with colleagues from Garden Organic and WCC investigating what they do there – the local councils provides households with two free hens and mentoring support to look after them as part of their waste reduction strategy. It took several more years, some unsuccessful Lottery bids and encouraging notes in the famous scrawly handwriting before, in 2013, success – a small grant to support a Hens@home project. A booklet and a website produced and a series of three training courses for aspiring hen mentors. It is early April, the road show has arrived in Oxfordshire and I’m on the course at Hill End Outdoor Centre to learn about how to look after hens and impart ‘the knowledge’ to others as a mentor. Led by GO’s Pauline Pears and Ian Farrar from the British Hen Welfare Trust, the group – all experienced hen keepers, enjoyed an ‘Everything you always wanted to know about hens but were afraid to ask’-style day. Well of course we knew it all. Or did we? After the intros, ‘My hen flock is bigger than your hen flock’, ‘But mine has quails’, ‘ I know someone who has ostriches..’ we got onto the ‘simple multiple choice quiz’. Q1. ‘What is a hen’s comb for? (pretty philosophical for anyone who recalls the Falklands War 30 years ago, memorably described as ‘two bald men fighting over a comb’) ‘so it can be seen at a distance’, ‘to help keep it cool in hot weather’ or as a ‘warning to predators’. I think we all got that one (to keep it cool in hot weather) and the group soon moved on to the true/false session. ‘Hens have warm feet’ (true) ‘ A hen can run at 7mph’ (true) ‘Hens are strict vegetarians’ (false). Then it was the practical bit, holding a real live hen and discussing their illnesses. Like what to do when they are egg-bound – olive oil has something to do with the answer (not quite sure if it had to be ‘extra virgin’). I’ve never come across such easy to handle hens as the ones Ian brought along. I suppose they were just so grateful that they were now ex-battery, or perhaps they knew that bad behaviour could have consequences. There was a bit of a division in the group between the ‘utilitarians’ and the ‘hens as pets’ brigades. But we all agreed that the eggs can’t be produced for less than you can buy them for in the shops, so even the utilitarians have to recognise that this isn’t a fast way to riches. It certainly isn’t by the time you’ve got through the legal aspects of hen keeping. No kitchen waste (not even vegetarian – this has nothing to do with BSE. EU regs allegedly) and they aren’t even allowed access to your compost heap. Officially. So thanks to DEFRA the whole point of GO’s ‘Hens@home’ programme, which was supposed to provide a cheap and simple way of reducing the amount of kitchen waste going to landfill is undermined at a stroke. Don’t tell his Royal Highness or there will be some more of those tricky letters to Ministers landing on Whitehall desks. Strange when one participant (Lord Muck) had been over to Flanders to see for himself just how their programme works and just how successful it is as a waste reduction strategy. Flanders is erm…. in the EU, so ask DEFRA to clarify that one. To round off the day we had a long discussion on about ‘end of life’ for hens. Just in case you wondered, none of the options are actually legal either. Euthanasia by vet? No, they can only do that to pets, and hens are ‘farm animals’. Ring its neck yourself and bury it in the garden? No, you can only legally bury your pet. Ditto and send it for incineration? Try and find a waste carrier who will come and pick up one hen. The best we could come up with was cook it and then put it in the food waste collection … but you’ll have to remove the feathers first! The Oxford Farming Conference (OFC) is a bit of a fixture in the food and farming calendar. The great and the good show up every year. Sometimes (like last year) a former activist does public penance for their past foolishness and bends the knee to the corporate behomoth – as Mark Lynas did, disavowing his activist past with Corporate Watch and announcing his conversion to the cause of GM technology. For the past five years there has been a alternative, the Oxford Real Farming Conference (ORFC), founded by Colin Tudge and his wife Ruth West. The difference could hardly be more stark, one has a ticket price of £375 and is sponsored by Syngenta, McDonalds and a host of other agri-business giants. The other costs £20 and isn’t sponsored by anybody. But they are both in Oxford, on the same days. This helps, as I discovered when I got a call from the Labour Party the weekend before asking for assistance. 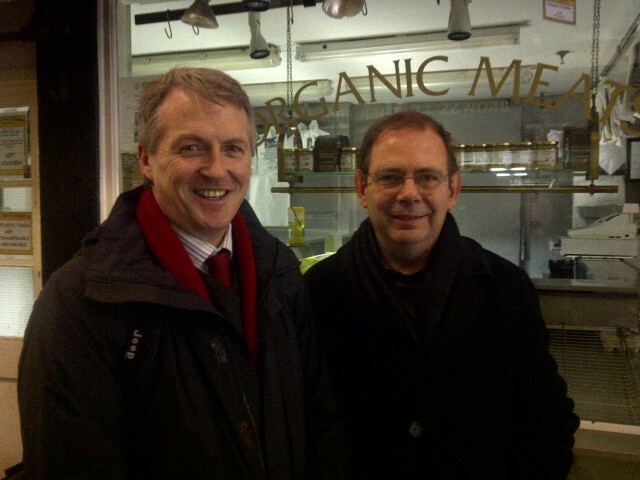 Huw Irranca-Davies the Shadow Food and Farming Minister was due to pitch up at the OFC and make a speech, but wanted the chance of a different perspective and could I help? Delighted. Suggested a visit to the ORFC. The response was amusing and instructive. Yes, but can it be incognito as they wouldn’t want the NFU to throw a fit (I thought Mrs Thatcher had tamed the power of trade unions decades ago – clearly not in this case….). Now Irranca-Davies turns out not to be a New Labour clone at all. Apart from this rebellious behaviour towards this masters in the NFU, it turns out that his wife’s family (the Irranca’s of his name) are Italian immigrants to the Welsh valleys (he represents the former mining, now rural, constituency of Ogmore in west Wales) who run a small family dairy farm making cheese, mostly a local parmesan and pecorino. So Huw knows a bit about farming and indeed the situation of small rural farms. What to take him to? Why the session on the future of family farms in that home of Welsh exiles in Oxford, Jesus College. It turned out to be a triumph. The speakers were diverse, thoughtful and amusing and the audience young and scruffy enough to look as if they might even have some connection with family farms. Indeed Anneleise the no 1 Labour candidate in the south east for the forthcoming Euro elections brought along her perfectly behaved 6 month old son Freddy, who was naturally fed only on locally produced milk and ensured the session had the widest age range of any at the conference. Star performer was a young woman from a family farm in Herefordshire, Becca Watkins. She had a lot of important points to make about generational continuity and it benefits for community solidarity and a sensitivity to landscape bio-diversity that a long term connection to ‘place’ brings, as well as some sharp words about the risks of family inheritance, ranging from a lack of willingness to innovate, to the tensions between generations and the boundaries (or lack of them), between parents/offspring and business partners of different generations. Peppered with jokes and anecdotes of the ‘I know you don’t put jeans in the colours wash, mother’ -type, she painted a vivid picture of life beneath the calm bucolic surface, and revealed to an amazed audience that ‘the Archers’ aren’t real people – though their travails are real enough in rural communities. @becca_watkins1 @divinity65 @ORFC @AnnelieseDodds fantastic personal insights from you, on challenges of farm succession. Enjoyed it too! Afterwards we repaired to ‘the Mitre’ for tea and a discussion on some of the issues with Joe from Cultivate and Michel from the Centre for Agro-Ecology and Food Security at Coventry University and a photo opp for Annleise with Huw promoting local (ish) south east foods. I never knew politics could be that much fun! It was a great idea while it lasted. Or was it? Oxford’s People’s Supermarket (TPS) which opened with great fanfare in July 2102 on boho Cowley Road, closed at the end of November. I’m almost embarrassed to say (but several people have recently reminded me) that at the time it opened I forecast it wouldn’t survive to see 2014. Rare indeed is it for my predictions to be so accurate and I’m sorry for those who put so much effort into it. So what went wrong? The warning signs were there from the very first meting in the Methodist Church Hall on Cowley Road in Spring 2012. The presentation to a large audience was not about the unique offering of the soon-to-open TPS, but on the wickedness of Tesco. The USP was … ‘Tesco is a bad, bad supermarket who rip off their customers and we are going to undercut them and give local people a fair deal’. This didn’t strike me at the time as a credible business plan and I stood up and said so. Interestingly the response was slightly puzzling, and it basically consisted of saying almost the exact opposite, essentially that TPS would provide a unique service of local food, organic fruit and veg, fair trade and ethical stuff (wholefoods and household products) great bread and a wonderful atmosphere, seven days a week right here on Cowley Road. Fair enough, except that actually of all the places on the planet, Cowley Road has all these things in spades already…. Uhuru, the Cultivate VegVan, the East Oxford Farmers Market, SESI, Gibbons Bakery and a myriad of interesting family-run specialist ethnic shops. Ah well the response to my and by now others, questions on this point, they aren’t all in one place and quite a few of them (Cultivate, Farmers Market) are only open one day a week so we are different and unique. It duly came to pass that TPS opened – but in a way that shocked its potential core customer base. Essentially between the tahini and rice cakes, most of the stock was snickers, crisps and frozen sprouts and cheap chicken from Bookers. So cheap certainly, some of it even competitive with Tesco…shame there were only about a dozen lines at any one time that were cheaper, and that the entire stock line was less than 10% of the Tesco 200m away. Confusion reigned. Was the TPS really a cheap and cheerful outlet targetted at a customer base that couldn’t afford Tesco prices? Or was it something a bit more right-on? The problem with this confusion was that while the right-on market probably would shop there given an appropriate product range, after all good as the farmers market is, its only open on Saturdays, the products on sale were mainly of little interest to that demographic. Meantime the poorer end of the spectrum are people who take their shopping very seriously. They get the cheap offers in Tesco, then head off to the Co-op for theirs, followed by occasional pickings from the aisles of Sainsbury and a long slow perusal of the Asian supermarkets like Tahmid Stores, where in truth the prices can literally be one tenth that of their ‘rival’ Uhuru, right across the road, combined with an occasional trip out to Aldi or Lidl beyond the ring road. Anyone on a low income knows this. Even I do. Where does the TPS fit into this? Its another stop on the hunt for bargains, mis-priced goods and special offers. Only the stock range is so pitiful that finding a real bargain is something of a miracle. It didn’t take all that long for this to become apparent. Bargain hunters largely shunned the shop and the boho middle classes did the same for entirely different reasons. Only students who lived really near by and couldn’t be bothered to check out the Asian shops or walk the extra 300m to Tesco, were regulars. And there weren’t enough of them because it didn’t sell booze. Over time TPS created a customer base of its members. Commit yourself to paying £12 a year membership fee and volunteering to work in the shop for four hours every four weeks and there was a 20% discount on the sale price. Not bad if you had the time and didn’t want to spend those four hours searching the shelves of the wicked Tesco over the road. Fine for the members, but the seeds of disaster for TPS. One supplier who asked to remain anonymous, told me that for example, meat was bought in at say £10 and sold on for £12.50. With err.. a 20% discount to members. You don’t even need to ‘do the math’ to work out that after paying for heat, light, rent, ‘shrinkage’ and staff costs (the manager was paid, rumoured to be a hard to believe £35k pa, even if the staff weren’t) this led to a cracking loss on every item sold. Talking of ‘shrinkage’…. quite early on the TPS suffered a major theft. The takings from a Friday and the weekend were in the office at the back. On a Monday afternoon they still hadn’t been banked and amounted to some £2,000. They all disappeared. The Police were called and there were tales of the thieves shimmying over a wall at the back. A month or so later the rather more prosaic truth came out. One of the volunteer members had walked into the office, seen the cash and couldn’t resist the temptation. Easy-peasy walking out of the front door with a couple of shopping bags and a cheery wave to fellow volunteers, especially as with nearly 600 member/volunteers, keeping a track on everyone coming in and out of the office on any particular day was a complete nightmare. By this summer the runes weren’t looking good. The pile of cash was burning ever so quickly. Even the decision to move upmarket and ditch the ‘cheaper than Tesco’ pretence didn’t cut it. The problem was that while the volunteers (and the media) were being told that the whole thing was fine, important bills weren’t getting paid, like business rates, the rent and the HMRC. Neither Oxford City Council, nor landlord, happy. Both asked for payments in advance. Tough, but not totally surprising. Suppliers, right-on co-ops and ethical businesses themselves, started not getting paid instead. They stopped supplying. 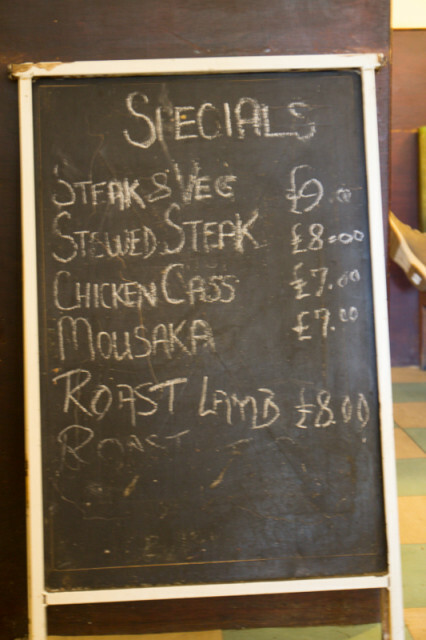 The customers noticed and the writing was on the wall. By mid-November it was all over and the landlord insisted that they vacate at the end of the month. The lessons? From my perspective (I never joined – I always thought it was a ‘turkey’ so this is an outsiders perspective) first, huge confusion as to who was the target demographic right at the start – people still remarked on the ‘Bookers frozen foods’ of the first few weeks in the final weeks. Second, an assumption that Tesco was expensive and could be beaten at its own game. Well no, they make a lot of profit and some things are quite expensive, but that doesn’t make it an expensive supermarket. Third, in my view, a pretty elitist view of how people shop. People on low incomes go to lots of shops in search of bargains – and pick up just the bargains from them. Every penny matters. And finally…. when TPS moved upmarket it found itself in competition with the Farmers Market and Uhuru, amongst others. The differences being that both have a much wider range of stock, much better displayed in contexts that aren’t intimidating (several people commented to me that they felt they might get ‘mugged’ between the garish in-shop graffiti and the dexion shelving dispalys). Possibly not cheaper, but that misunderstands that segment of the market, where every penny doesn’t count and the atmosphere and who you might run into and gossip with, are just as important. In the end TPS failed both ends of its potential market and the rest as they say, is history. One benefit of the work done on my allotment orchard in the summer to relieve flooding problems (see my post of 26 June 2103) was a clearing away of a large part of the very unruly hedge at the back of the plot. Now the space has a new use. Bees. I’ve been approached by a local beekeeper who wants to put four hives on the site. The space carved out by the council digger to lay the land drain is just the right size and the remaining hedge is ideal as a screen, keeping bees away from people. 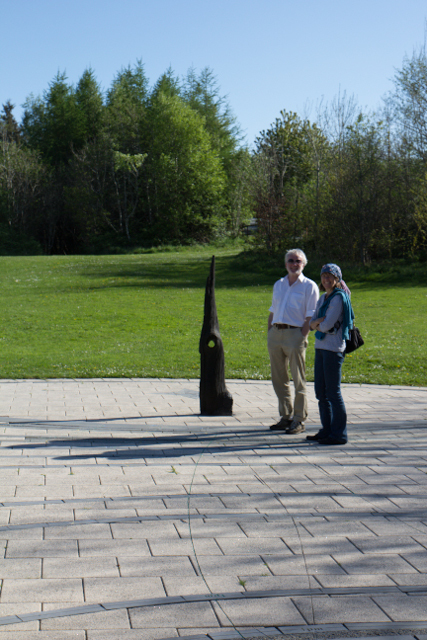 David and his wife and daughter came up to inspect and discuss practicalities a few days ago. As well as the hives there will be a shed to keep their equipment in. This will include a size-appropriate bee suit for their six year old. Soooo sweet! And for those of you who believe that there is some kind of pre-ordained plan to life, the surname of my beekeeper family? Mead, of course. Nominative determinism rules OK.
A 1,000 litre water container was delivered by Haynes of Challow to the Barracks Lane Community Garden in Cowley recently. All part of the community garden’s practice of promoting sustainability by storing the rain water harvest. Upon inspection it turned out that its original purpose had been the import of honey and that about 35 litres was still left in the bottom. What a find! And what an opportunity. It didn’t take long to hatch the idea of a mead-making workshop using this unexpected bounty. Fifteen people turned up on 5 October for a day long workshop run by permaculture expert Phil and local beekeeper Garry and those with demi-johns were able to take away some of the resulting liquid. So… cheers to the future rainwater harvest and cheers to the happy accident of so much lovely free honey being put to such an appropriately seasonal use. What an utterly wonderfully productive autumn its been in the orchard! 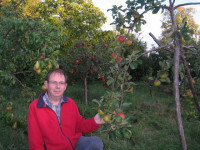 Apart from figs (see previous post) its been the year for pears and apples. But suffering from a broken right shoulder from my cycle accident in August, harvesting them all has been a bit of a challenge. 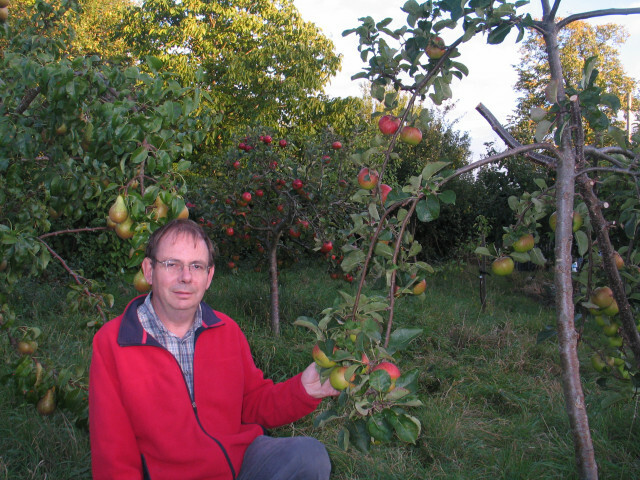 Step forward Tiddly Pommes – prop Rupert Griffin, who runs this micro company which collects spare apples from gardens, allotments, orchards and hedgerows and juices them. They then sell a range of quirkily-labelled varieties at their outlet at the East Oxford Farmers Market and through Cultivate’s veg van. So last week Rupert pitched up on my allotment and between us we picked all the ‘James Grieve’ I had – a good apple but so late this year that it was being overtaken by other later-ripening varieties. So rather than leave them on the tree and lose them to birds, Tiddly Pommes will now be selling the juice and I get a 25% cut. Hooray!